Mars Rover Opportunity to Spend Several Months at "Greeley Haven"
NASA’s Mars Exploration Rover Opportunity is spending its fifth winter on Mars and is now exploring a site known as “Greeley Haven.” Due to a thick coating of dust on its solar panels, scientists believe it is necessary to stay on a sun-facing slope. 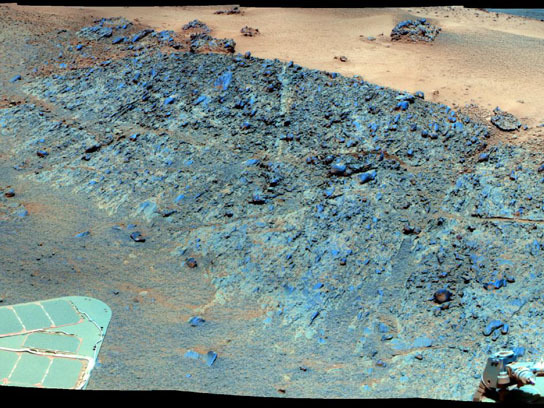 Opportunity will be inspecting mineral compositions and textures on the outcrop, recording a full-circle, color panorama, and running a radio-science investigation of the interior of Mars. NASA’s Mars Exploration Rover Opportunity will spend the next several months at a site informally named “Greeley Haven.” The name is a tribute to planetary geologist Ronald Greeley (1939-2011), who was a member of the science team for the Mars rovers and many other interplanetary missions. The site is an outcrop that provides a sun-facing slope to aid in maintaining adequate solar power during the rover’s fifth Martian winter. It also provides targets of scientific interest for the rover’s robotic arm to examine. Closer to the equator than its twin rover, Spirit, Opportunity did not need to stay on a sun-facing slope during previous winters. Now, however, Opportunity’s solar panels carry a thicker coating of dust than in the previous winters. Unless an unlikely wind cleans the panels in coming weeks, the team will use a strategy employed for three winters with Spirit: staying on a sun-facing slope. For several months of shortened daylight before and after the southern Mars winter solstice on March 30, 2012, the sun will pass relatively low in the northern sky from the rover’s perspective, and Opportunity will work on the north-facing slope. 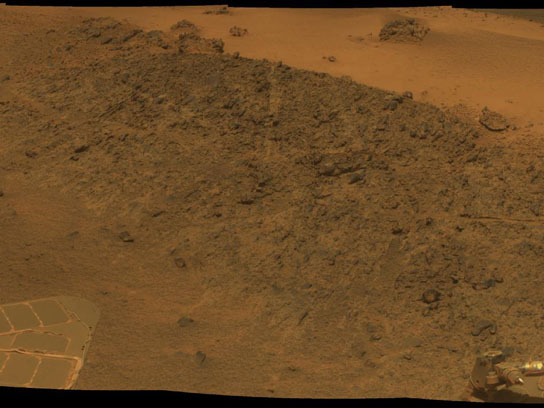 This mosaic was acquired by the Mars Exploration Rover Opportunity's Panoramic Camera (Pancam) on Sol 2793 (Dec. 2, 2011). It shows a north-facing outcrop, informally named "Greeley Haven," where Opportunity will work during the rover's fifth Martian winter. The radio-science investigation studies tiny wobbles in the rotation of Mars to gain insight about the planet’s core. It requires many weeks of radio-tracking the motion of a point on the surface of Mars to measure changes in the spin axis of the planet. 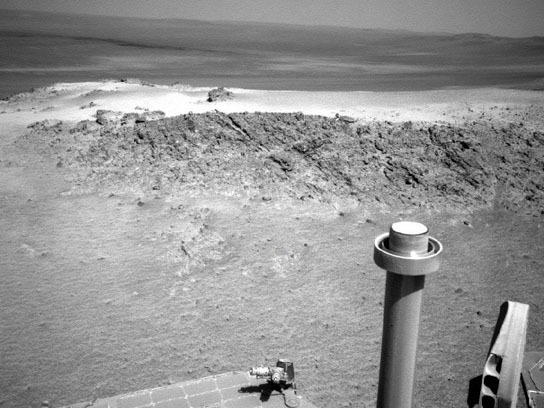 The winter worksite sits on the “Cape York” segment of the rim of Endeavour Crater. Opportunity reached the edge of this 14-mile-wide (22-kilometer-wide) crater five months ago after three years of driving from smaller Victoria Crater, which it studied for two years. Image: NASA/JPL-Caltech; NASA/JPL-Caltech/Cornell/Arizona State Univ. Be the first to comment on "Mars Rover Opportunity to Spend Several Months at “Greeley Haven”"